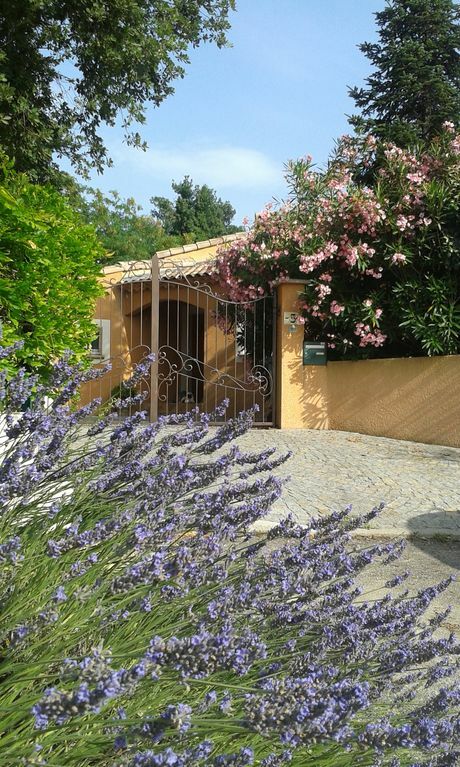 Single-storey house, built in 2003, in the heart of the superb 18-hole golf course of La Valdaine, in Montboucher sur Jabron, near Montélimar, halfway between Lyon and Marseille. Comprising 4 bedrooms, including a master suite, and a BZ bed in the gym. It also consists of 2 bathrooms (1 with shower, the second with shower and bath, double basin in each), 2 toilets, 1 kitchen with sliding doors to a terrace where meals are taken in the summer. This kitchen is fully equipped with oven, hob, hood, refrigerator, double sink, dishwasher. A second fridge freezer is also available. The living room of 55m2 has a table + chairs for 10 people, two sofas, 1 HD TV big screen with DVD player, Orange TV and Canal +, 1 Hi-Fi system with wireless headphones, an insert. - Complete kitchen equipment: Senseo coffee maker, bread maker, electric kettle, electric fryer, juice extractor, toaster, large WEBER BBQ outside. - 1 cot, a high chair on request and some toys are also available for young children. 1 Bike for a child 4-6 years, car pushes child's feet. The house is located in the center of the golf course, there is very little traffic: the place is very quiet and secure. Dogs accepted, within the strict limits of respect for neighbors and "cleaning the lawn" (no big watchdog). Possibility to walk freely by separate access behind the house. Commercial Director, 61 years old, maried , 3 daughters, this house is our Home from september to end of june. We rent it for some weeks during summer. relly focused on our guests comfort, we remain at your disposal to advise you and prepare your stay in order to discover the best of our countryland and local specialities. - optional cleaning at the end of the rental, deposit check of 150 € returned at the end of the renting if the house is properly cleaned - Possibility of supply of sheets / duvet covers 20 € per bed (double), and towels for 10 € / person. Accueil chaleureux et propriétaire toujours soucieux du confort de ses occupants. Nous avons passés une semaine très agréable au sein de cette magnifique maison, très calme. Le proprietaire de cette maison très sympa. Merci pour votre appréciation .Au plaisir de vous recevoir à nouveau! - hiking or cycling in the Vercors, Ardeche or in the Drome hills and hilltop villages, or descent of the Drome or Ardeche kayaking. - Many restaurants will make you taste authentic cuisine accompanied by our regional wines. You can also visit the truffle house, the sweet palace, and of course the nougat museum! - Festivals everywhere this summer, and many museums to visit: museum of silk, candy and nougat, fighter aviation, ancient city of Alba la Romaine, Castle of Madame de Sévigné, and the superb cave of Pont d'Arc, jewel of Paleolithic paintings.